Ever since the Disney Renaissance period ended with Tarzan in 1999, people have been pressuring Disney to up their game, insisting the current line of films dished out by the renowned company just aren't up to scratch. This is, in my eyes, a ridiculous statement. Whilst no recent Disney film has truly matched the artistry of most of the Renaissance films, there have been some truly memorable animated films from the company since the 2000s begun, including Lilo & Stitch, Atlantis: The Lost Empire, Treasure Planet, Bolt and, one of my favourites, The Princess and the Frog. 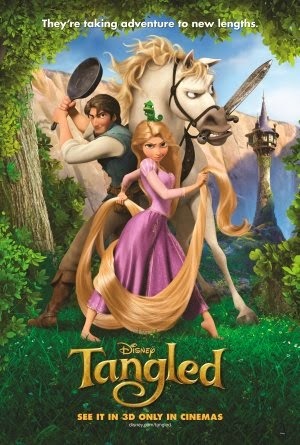 Their latest release, which marks the 50th animated film in the Disney animated canon, is Tangled (formerly Rapunzel), a film which really proves Disney are still capable of producing quality cinema. The story is loosely based on the traditional fairy tale, but with a number of additions and changes to make it feel fresh and unique. It centers around Rapunzel (Mandy Moore), a young princess who was blessed with magical hair, allowing her to heal anyone with just a recite of a special song. However, at a young age, the evil Mother Gothel (Donna Murphy) kidnapped Rapunzel, raising her as her own child and exploiting the powers of her magical hair to maintain her youth and beauty. It's not long before Rapunzel meets the dashing thief Flynn Rider (Zachary Levi), who she sees as an opportunity to escape and see the world she was kept from. What follows is an adventure beyond Rapunzel's wildest dreams as she finally explores the outside world after eighteen years of being locked away. Tangled is definitely not your traditional Disney princess film. Disney actually made the decision to alter the films title and plot to focus on the two central characters, Rapunzel and Flynn, instead of utilizing the traditional "damsel in distress" plot. Whilst this may feel like a step away from the traditional Disney style, the film still holds its own by balancing comedy and emotion and isn't afraid to show a terribly sinister side to it's villain, Mother Gothel. You'll find that the comedy mainly stems from Flynn Rider and his quirky, carefree nature, as well as Maximus, a mute horse determined to settle a personal score with the thief. I will admit, sometimes the film felt a bit too comedy based, but it doesn't change the fact that all of the humour is clever and witty. Rapunzel develops throughout the film noticeably as her former perceptions of the world being a cruel, selfish place are altered, and her paranoid nature vanquished, a realization that's well handled and realistically paced. Flynn Rider also realizes how nonsensical his ambitions are, and the characters are soon brought closer and closer together. 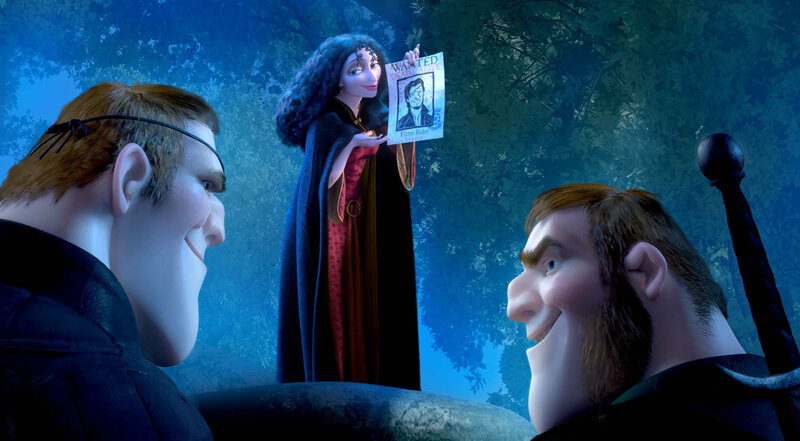 I think the villain, Mother Gothel, was very interesting. Whilst the film never exaggerates her kidnapping of Rapunzel, it really does immediately develop her as a spiteful person, willing to steal anything from anyone to help her selfish requirements. She's never really portrayed villainous at first, and seems like a caring mother who just wants Rapunzel to be safe, differing her a lot from the generic Disney villains who shout and chuckle evilly throughout the course of the story (not that there's anything wrong with that!). As the film progresses, she shows a darker, sinister side to her personality, which in turn reveals her desperation, and she establishes herself as a brilliant antagonist. The music throughout is excellent. The score was composed by Alan Menken, and is comprised of a plethora of powerful, majestic tunes alongside soothing, ambient pieces, all of which are terrific and really provide the film with a brilliant atmosphere. In traditional Disney style, the film is a musical, and there are many songs sung by the characters throughout, all of which are fantastic. My favourite was probably I've Got A Dream, a catchy, crazy anthem about characters aspirations and dreams, a central theme of the film. The animation was beautiful, and matched the style of traditional 2D animation excellently with a vibrant colour palette, smooth character animation and wonderfully crafted backdrops. The lighting throughout is incredibly rich, giving the film a bright, realistic and lively appearance. Being the most expensive animated film ever produced, you'd expect it to look great, and believe me, it does. The film, like most films these days, can be viewed in Disney Digital 3D, which works okay, but is still, as always, nothing more than gimmick that detracts from the films colour. Well, time to wrap things up. All I can really say is, go and see this film. It's brilliant. A dazzling effort from Disney and a memorable way to mark their 50th animated feature. It has everything the classics had, including catchy songs, stunning animation and lovable characters, and creatively adds to it's basic fairy tale premise, resulting in a film with a traditional and modern feel.